Women can often face a different set of challenges to men in the digital business world. Welcome to Should I Start A Podcast where each week Ronsley Vaz, with the help of a star-studded entrepreneurial guest lineup, explores why you should start a podcast; build an audience, and how to keep them hungry for more. If you’re thinking about starting a podcast, or simply finding a better way to get your message out to your audience, then this is the podcast for you. 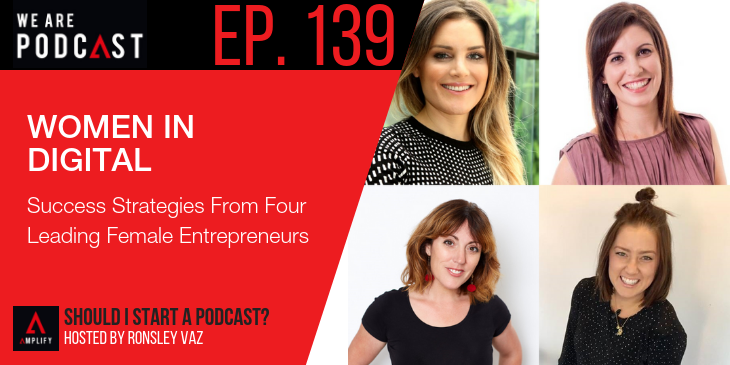 On this week's episode of Should I Start a Podcast we have an informative session recorded live at the We Are Podcast 2016 event, four top female digital entrepreneurs share their thoughts on the challenges and advantages of being a woman in digital. It’s a discussion that’s packed with personal insights, strategies and practical tips for achieving success as a digital entrepreneur. And it’s not just for the ladies. The guys will also get some great insights into creating more cohesive and fulfilling relationships with their partners, female colleagues and clients.